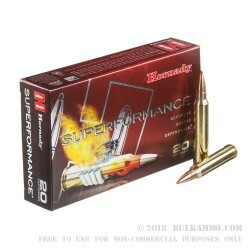 High performance ammunition from Hornaday, this 150 grain load is suitable for medium and large game and other precision shooting needs. The lighter projectile offers a flat shooting .300 Win. Mag. For moderate ranges and a larger range of versatility in hunting. The polymer tip offers reliable penetration and bullet deformation. The newly manufactured brass case paired with the GMX projectile by Hornaday offer a California compliant projectile capable of meeting terminal needs for hunters everywhere. The polymer tip ensures reliable mushroom deformation and the copper alloy reduces muzzle fouling and is approved for use in “fragile hunting ecosystems”. 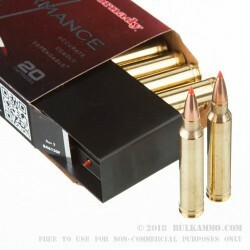 High weight retention on the projectile make this an ideal round for game use. The light weight offers interesting options for velocity (3400FPS) and energy (3850 Ft. Lbs.). As branded, this is truly a “Superformance” load. The round is packaged in boxes of 20 with a plastic insert. The casing is new manufacture brass with a boxer primer, ensuring easy reloadability. 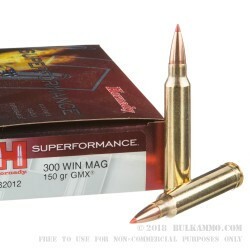 Suitable for use in “.300WM” “.300 Winchester Magnum” or “.300 Win. Mag.” Marked modern firearms. 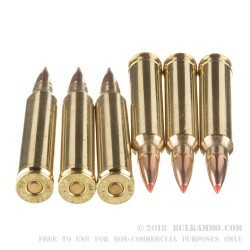 The recoil is manageable for this belted magnum cartridge, due to custom powder and projectile mating along with the alloy and design of the projectile. A modern hunting round built for extreme use cases.